Any trip to Belize probably includes a lot of beach time and fun in the amazing water. It’s certainly known for those attractions. However Belize is also home to more than that – don’t overlook the beautiful inland filled with natural lush forests and an abundance of diverse wildlife. 60% of Belize’s land surface is covered by forests. One great way to help a good cause and get to experience seeing some of that wildlife population in person is by visiting the Belize Zoo. 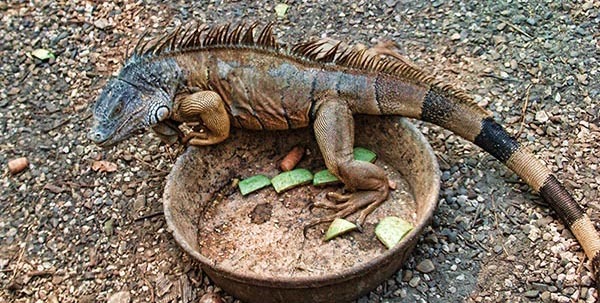 The Belize Zoo’s slogan is “the best little zoo in the world” – while I can’t verify that claim it is very unique and different from any other zoo I’ve been to. It was started in 1983 after a film crew finished working on a documentary and had nowhere to leave the star animals of its show. Now tame they could not be returned to the wild. One of the crew’s staff stayed behind to care for the animals and the rest is history. The zoo receives no funding from the government, it only houses native animals, and it has never taken an animal from the wild. Located less than 30 miles from Belize City right on the main highway visitors have easy access getting to it’s 29 acres of natural habitat. 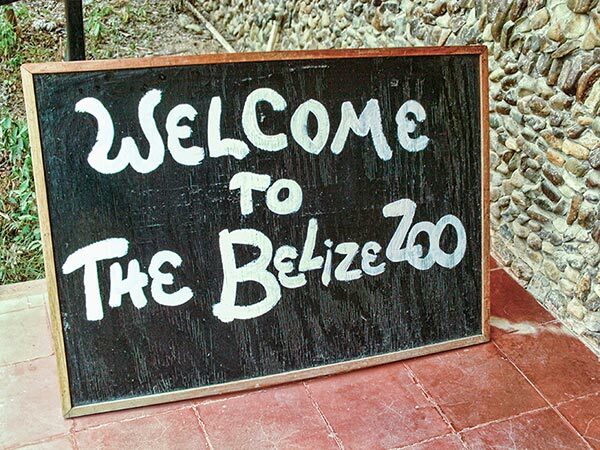 Belize Zoo takes care of more than 150 animals and more than 45 different species including the 5 native wildcat species (jaguar being the biggest), baird’s tapir, monkeys, exotic birds, hawks, eagles and reptiles (including crocs and snakes). The star of the zoo is undoubtedly it’s big cats, especially the Jaguars. While there we met Junior, a young adult male who was busy pacing in the heat waiting to be fed a meal. The beautiful coat of fur the jaguars have is in my opinion what makes them one of the most beautiful big cats in the world. For a few extra dollars you can even get up close and personal with Junior while they feed him (behind the safety of a cage). Many of the animals at the zoo (like all zoos) are nocturnal and/or resting during the heat of the day. They do offer a night tour for those interested in seeing the animals during the more active hours of the night. 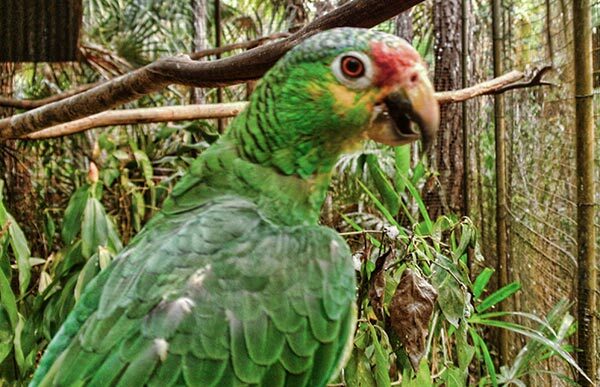 There are also special encounters with macaws and boa snakes for an extra fee. The zoo has several conservation programs that include saving and rehabilitating ‘problematic’ Jaguars that kill livestock, and another to help restore wild Harpy Eagle populations. They raise all their own money through donations and visitor’s entry fees. 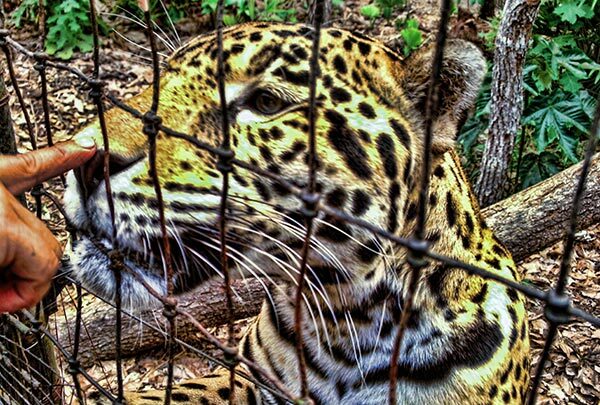 They don’t take wild animals – they have rescues, confiscated illegal pets, abandoned, orphaned or captive bred animals. They are involved in conservation, research, and rehabilitation. They are GREEN! They recycle, compost, etc. While getting see Belize’s native animals is a blast, it’s also outdoors in the heat and humidity. You will sweat a lot! Try to visit early during the cooler hours for more animal activity. Wear light clothes to stay cooler.